All the tips and information you need to make your visit to the extraordinary archaeological site of Delos a memorable one, whether you are passionate about Greek history or just an incidental visitor. Looking over the ancient theatre towards the modern port of Delos. I first visited Delos towards the end of summer in 1990. This was during my island hopping adventure that took me from Crete to Athens. The ferry ride to the island was as unforgettable as the archaeological site. The crossing was not smooth and I have been saved by advice I overheard on that day that I have I applied many times since: keep your eyes focused on the horizon. On my most recent visit, the beginning of summer in 2018, thankfully there was no need for this advice. While the archaeological site and its setting is every bit as spectacular as I remember it, getting to Delos however is now quite a different experience. Walking through the Theatre Quarter. Back in 1990 the boats were smaller and they ferried fewer visitors to the island. Now there are fewer crossings for tourists to choose from. And the ferries are substantially bigger, carrying around 200 or so people. While the experience of getting to Delos island has changed dramatically, I am not going to go all misty-eyed and harp on about how it was all so much better before. On the contrary. Despite having had to queue for 20 minutes to pay my entrance fee and even with so many more people on the island, I enjoyed this visit as much as I did my first. Delos is, and always will be, on my list of Top Ten places to visit in Greece. In fact as I write this the day after my visit, I am seriously thinking about going again today. There are, however, a few things I would do differently. Certainly in terms of getting to the island. What follows then are my tips for making your visit an enjoyable and rewarding one – what I will do differently if indeed I return. Jump to: 1. What is there to see on Delos? 2. Facts about Delos 3. How to get to Delos a. From Mykonos b. From Naxos c. From Paros d. By yacht 4. Ferry schedule 5. Entrance fee 6. Guided tours of Delos 7. Self guided tours of Delos 8. Map of Delos 9. Guidebook and pamphlets 10. Self guided walking route 11. Is Delos worth a visit? What is there to see on Delos? The archaeological site on the island of Delos is the remains of a sanctuary to the gods Apollo and Artemis, and the city that developed around it. The on-site museum has one of the finest collections of ancient Greek sculpture, as well as displays exhibiting numerous artefacts recovered from excavations around the island. These artefacts give an insight into the daily life of the ancient inhabitants of the island. Just three of the many statues on display in the island’s museum. 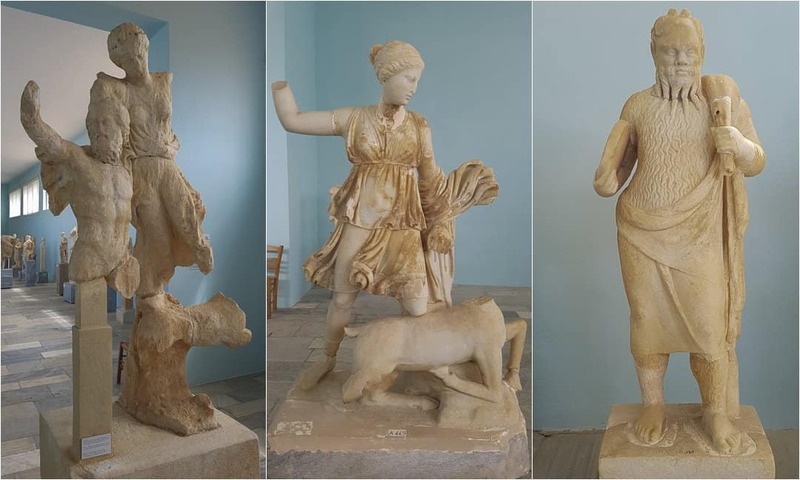 From left to right: a fragment from the east pediment of the Temple of the Athenians depicting the Boreas abducting Oreithyia (5th century BC); Artemis killing a deer (2nd century BC); an actor from the stoibadeion (2nd century BC). For an island that is no more than 5 kilometres long and around 1,300 wide the estimated population for 90 BC is 30,000. The population survey carried out by the Greek government in 2001 records 14 inhabitants on the island. Although the island was largely a religious centre, it also had a thriving commercial port. An estimated 750,000 tons of merchandise passed through the port each year during the first century BC. Excavations of the archaeological site started in 1872 by the Greek Archaeological Service and in 1873 by the École française d’Athènes. Archaeologists are still excavating today, although much of the work focuses on securing the site for the increasing volumes of tourists. Read more about the history of archaeological resarch on the island on the website of the French school in Athens. As the island has been uninhabited since the 7th century BC, the integrity of the archaeological site remains largely intact. And restoration work on the buildings has not challenged the site’s authenticity, as has been the case elsewhere. For these reasons, as well as the historical and archaeological significance of the place in antiquity, Delos was placed on the UNESCO list of World Heritage Sites in 1990. You can only get to Delos on a day trip by ferry from another island. Most commonly the point of departure is Mykonos, but there are also day trips from the islands of Naxos and Paros. There are no hotels or other accommodation providers on the island, the only inhabitants are the caretakers and archaeologists. The Ferry to Delos from Mykonos leaves from Mykonos Old Port – this is marked with a yellow map-pin (on the Google map, zoom out from Delos and you will see the yellow pins on Mykonos). There is a ticket booth next to the pier where the Delos ferry births. Here you can buy return tickets for €20 (this does not include entry to the site). If you prefer to have a guided tour, these are available for €50 – they include the ferry trip, entry to the site and the guide’s fees. If you have your own yacht, you can get yourself to Delos. Sail to the island, and simply pay at the ticket office to tour the site and museum. If like me you do not have your own yacht, for what seems to me a very reasonable price you can take one of a number of private cruises to the island – and even visit nearby Rhenia Island too. Throughout the year there are two ferry crossings to Delos, daily: one at 10.00 am and one at 17.00 pm. There are also two return journeys daily: at 13.30 pm and 19.30 pm. During peak tourist season and from Tuesdays to Sundays only (i.e. not Mondays) there are two additional crossings each way: 9.00 am and 11.30 am to Delos and 12.00 noon and 15.00 pm from Delos to Mykonos. There seems to be no forewarning of when the extra crossings start. All available information says 10 May, but these were not running as of 11 May 2018. Unless you have reserved a guided tour of Delos that includes the entry fee, you are still required to pay to enter the site when you get off the ferry. 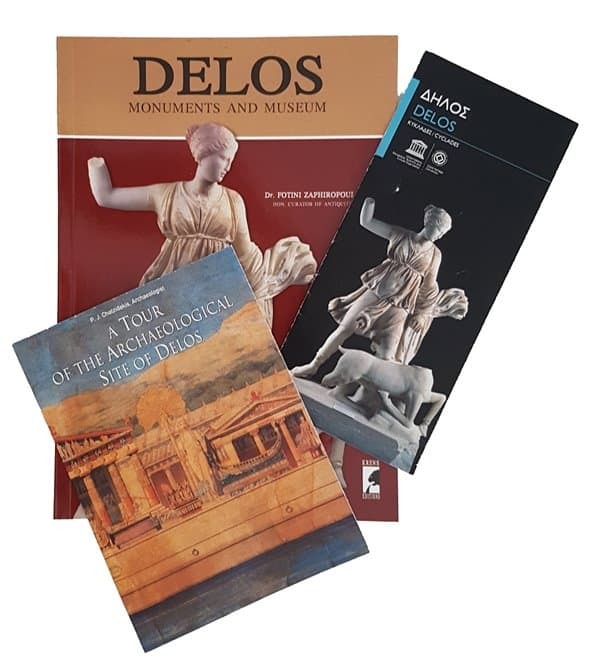 As of May 2018, the entrance fee for the Archaeological Site and Museum of Delos is €12 for an adult (under 18s get free entry, take your passport). 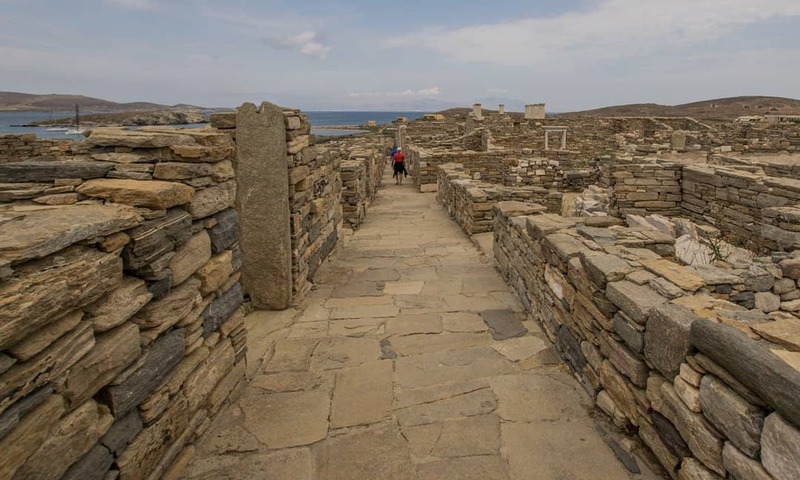 The guided tours of Delos cost €50 per person. Included in that price is a return ferry trip to the island from Mykonos, entry to the archaeological site and museum, and the guide’s fees. For an extra cost you can include a transfer from your hotel/accommodation to the port. Guided tours are available in English, Italian, Spanish, German and French. Although do note, while there are daily tours for English speaking visitors, guided tours in the other languages are not available daily. The guides follow a set route around the main features of the archaeological site, before leaving you at the museum to explore that yourself with ample time to see more of the site if you wish. If you do not know much about Greek archaeology and history, I strongly recommend taking a tour. The few people I spoke to all enjoyed the guided tour, coming away feeling their guides gave them a great introduction to the history of the site. The guides will take you to the highlights and explain what otherwise looks like a pile of rocks. While standing around listening to a guide in the heat of a summer’s day is not always a great way to visit an archaeology site, as you have limited time on the island, a guide beats reading a guidebook or the text-intensive information panels. A big plus with taking a guided tour is that you do not have to wait in a queue once you reach the island to buy an entrance ticket. You do not have to take a guided tour. In which case, purchase your ferry ticket at the booth on the pier (or at any of the travel agents in Mykonos) for €20 and then pay a further €12 at the site ticket office when you arrive on the island. A total cost of €32. Or, if you are on Paros or Naxos, the €50 to cover the ferry ride to Delos and the €12 entry fee to Delos. If you choose this option, I recommend being ready to get off the ferry as soon as it docks. Ferries from Mykonos and Naxos/Paros arrive around the same time and all those people who are not booked on a guided tour are then required to queue for a ticket to enter the site. You can wait up to 30 minutes if you are last of the boat. So as the boat nears the island, stand at the back of the boat and be ready to be one of the first off the boat. And then hot foot it to the ticket office. There is no time to be taking in the atmosphere once your feet are back on terra firma and taking photographs. Do that after you have your ticket. To stay ahead of the groups being led by guides, I headed straight to the museum. There were only two other people going round the galleries at the same time as I did. For anyone wanting a good book on the site and museum, I recommend the book Delos: monuments and Museum by Fotini Zaphiropoulou (2016). It is an excellent account of the island’s history and archaeology, with excellent photos. It is available in the souvenir shop on the island for €15, or in many of the souvenir shops in Mykonos for €10. The latest edition can be bought on both amazon.com and amazon.co.uk. A free pamphlet, Delos, is available at the ferry ticket office on Mykonos and the site ticket office. This is a basic leaflet. And while it does have a map, it is a simple one; but enough to get around the site and see some of the main features. The best, and also free (although definitely worth a few Euros! ), leaflet I found was in the archaeology museum in Mykonos: A Tour of the Archaeological Site of Delos. This not only has an excellent map, with nearly 100 features marked, it also has three suggested routes, taking an hour and a half, three hours and five hours. The pamphlet also has a good line-drawing showing a reconstruction of the sanctuary and ancient town. From this you get an excellent idea of just how extensive the ancient town was at its height. Without a guide and going it alone is a brave move, particularly without a map. Although there is a map at the entrance to the site that shows three suggested routes (as noted for the pamphlet mentioned above), this is only followed through with colour coded arrows. These are incomplete and I gave up trying to follow them. If you want to follow these, you really do need to get a copy of the pamphlet A Tour of the Archaeological Site of Delos, freely available in the archaeology museum in Mykonos. These are good routes, but I feel they segment the site too much. The route I recommend is as follows. And an be done as quickly as slowly as you wish. I would get ahead of the guide-groups and head straight to the theatre. And then follow a circular route around the main section of the site. This route, with the museum, can easily be done in three hours. If you stay longer than three hours, you could easily add on a climb up to the Sanctuary of Zeus and Athena, or walk on to the Gymnasium and Stadium. Is Delos Worth A Visit? Besides being one of the most important mythological, historical and archaeological sites in Greece, Delos is a wonderful island to visit. 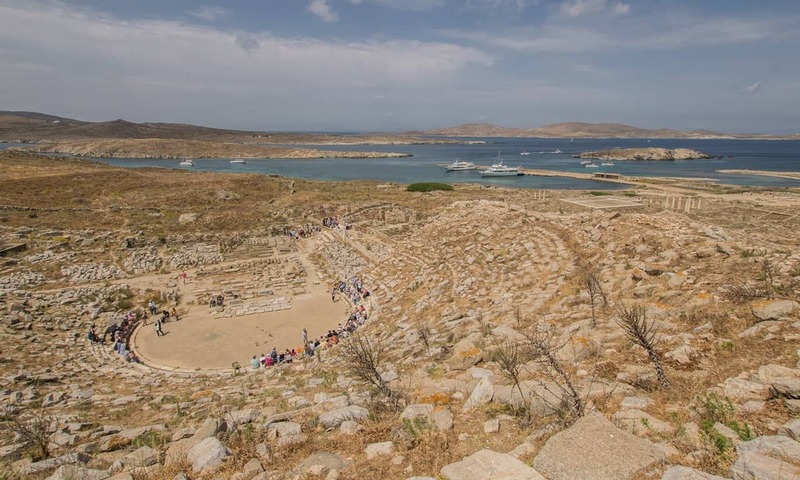 Whether you catch the ferry to Delos to take in as much of its cultural significance as you can, or go to experience for yourself one of the most evocative heritage sites in Greece, you will not be disappointed. The island of Delos truly does have something for everyone visiting Greece. For those passionate about Greek history and archaeology, you may want to know why the archaeological site of Delos is so important? There are at least three broad reasons why the site is culturally significant. First, architecture on Delos had a great influence on the development of architecture elsewhere during the Greco-Roman period. Second, from the 3rd millennium BC to the 7th century AD the island was an important place for the civilisations of the Aegean. For example, from the 7th to the 1st century BC, Delos was the site of one of the most important Hellensitic sanctuaries. Until at least 316 BC every four years in May the island hosted the ‘Feast of the Delians’, which was one of the major events of the region on a par with the the Olympic and the Pythic Games. Finally, Delos is directly associated with one of the main myths of Hellenic civilisation: it was on the island that Leto gave birth to Apollo and Artemis. Added to the historical significance of the place itself, is the archaeological importance. For the casual visitor, if you are going to visit an archaeological site, you can’t do much better than Delos. And certainly, there is nothing else to see on Mykonos. Not only is the archaeological site an outstanding example of a religious sanctuary and a complete Mediterranean port and settlement, the preservation and authenticity of the site is quite exceptional. Added to all this, the ferry ride from Mykonos to Delos is only 30 minutes, which is in itself an adventure for some. And considering three hours is the longest time you will have to stay on the island, both lovers of archaeology and Greek history and incidental tourists are catered for. Three hours is ample time to explore a lot of the site, and also a enough time to marvel at some of the highlights and enjoy a cool frappe or freshly squeezed ice cold orange juice with a spectacular view before heading back to the contemporary world.